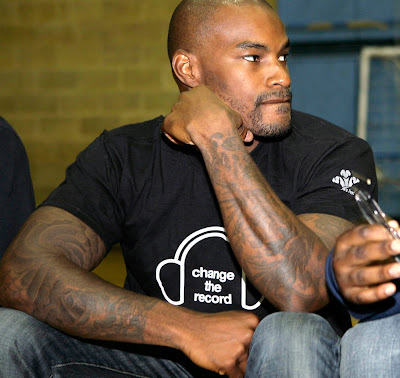 Tyson Beckford has numerous tattoo designs covering his body, including a large cross on his back with the words "Lord of Lord's" in the center. 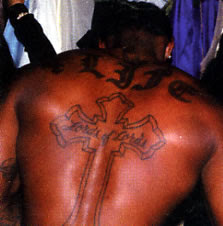 The tattoos on his left arm include, the name "Tyson" in old English lettering, the classic "Laugh Now, Smile Later" masks with two banners containing the words, a dragon on his forearm, plus a spider web on his elbow among several other tattoo designs within the sleeve. 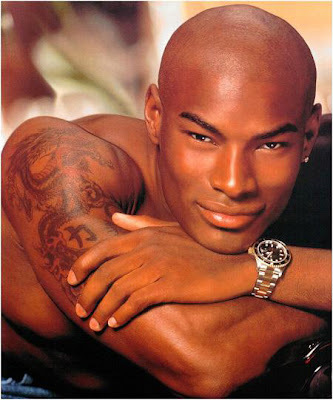 The tattoos on his right arm include, an array of clouds which covers most of his bicep and shoulder area, plus a large Chinese dragon and a spider web on his elbow. 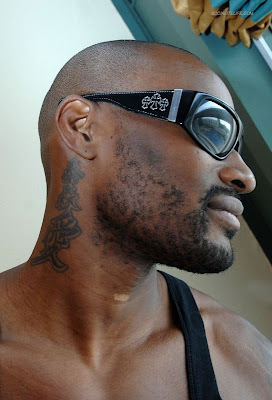 Tyson has two tattoo designs on his neck, the name of his son "Jordan" on the left side and some Kanji characters on the right side.